Say “I Do” with Sonesta, and Your Honeymoon’s on Us! While you’re counting the ways you adore your spouse-to-be, might we suggest you also count the reasons to hold your dream wedding on top of the Sonesta Fort Lauderdale Beach? While you’re making your list, you’ll want to know that getting married at our idyllic venue earns you a FREE 2-night honeymoon at the Sonesta Ocean Point Resort on the beautiful Caribbean island of Sint Maarten. 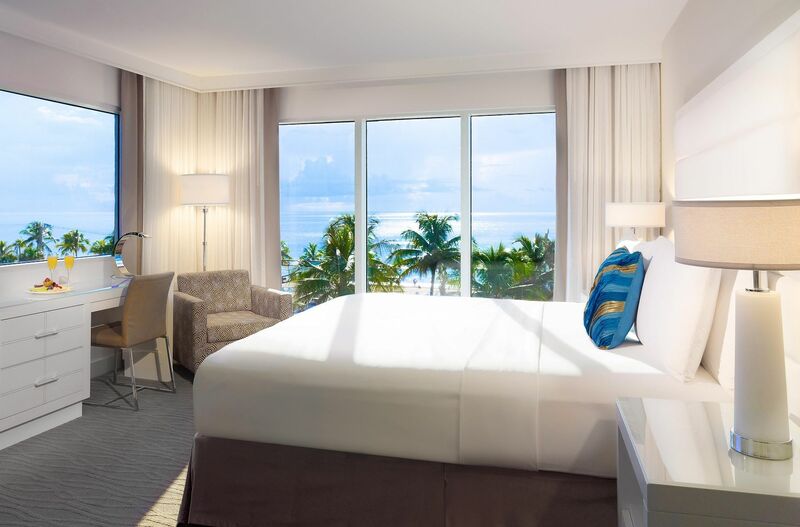 Our stunning oceanfront locale – right on Fort Lauderdale’s Seven-Mile Beach – and gorgeous penthouse space with floor-to-ceiling windows make the Sonesta Fort Lauderdale Beach the perfect setting for your dream wedding. Our elegant event space gives you and your guests supreme views of the long sandy shore and the sweeping Atlantic Ocean. And our Food Is Art catering, along with the dedicated guidance of our experienced planning staff, puts delicious and creative fare on your plates. Plus, now through January 31, 2016, any contracted wedding at the Sonesta Fort Lauderdale that exceeds $15,000 in food and beverage earns a complimentary two-night stay for two* at our new all-inclusive, adults-only experience, the Sonesta Ocean Point Resort – Sint Maarten. Our all-inclusive, five-star, all-suite resort includes an array of dining options, bars, lounges, amenities and exemplary service perfect for your first days of married life. What’s more, it’s home to the newly opened, contemporary-chic Azul Restaurant, dramatically perched atop a cliff overlooking Maho Bay, a Caribbean casual gem with a sleek design and rooftop lounge with breathtaking views. During your stay, you will also enjoy a day pass to the neighboring Sonesta Great Bay Beach Resort, Casino & Spa, with complimentary use of all its facilities. Of course, a free honeymoon isn’t reason enough to trust your big day to Sonesta. We’ve been delivering unrivalled hospitality and service to our guests for more than 75 years. We deliver perfection to brides and grooms because we believe it’s a privilege to be part of such a momentous occasion. When you entrust your wedding to us, we cover every detail in the planning of your ceremony and reception, so the only thing you need to do is enjoy the first day of the rest of your lives. Call 954.302.5208 to talk to a Wedding Planner about our Sonesta Fort Lauderdale Beach wedding packages today, and then pack your bags for a complimentary honeymoon to Sint Maarten! * Offer valid for weddings committed by Jan 31, 2016. Stays are valid for reservations made October – December 19, 2015 or April 10 – December 19, 2016; blackout dates may apply. Couples looking to extend the wedding bliss are welcome to purchase additional nights at the best available rate. Air transportation is not included.